Getting a new website can be like walking into a minefield in terms of search engine optimization. Worst case scenario, you could lose all your search engine rankings and will have to start from scratch. Luckily, this doesn’t have to happen - as long as you do the transition the right way. 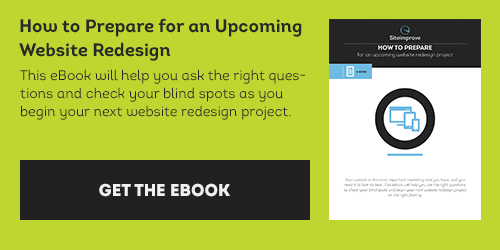 Download The E-Book: How To Prepare For A Website Redesign to help you with website SEO and overall strategy during a redesign. The most important thing to remember is that the search engines are an important part of the target audience for your new website. If you make sure that it's easy for the search engines to understand the changes you've made, (including domain, site structure, links, and so on) you'll increase the chances that you make it through the transition without dropping in the search results. You might even come out ahead. Here is a list of nine things to do to avoid losing search engine rankings when getting a new website. If getting a new website also means getting new URL's for the pages, it's important that you use 301 redirects to inform the search engines that the content has permanently moved to a new location. This way the search engines know that the new pages have the same or similar content, and it's safe to assign the same rank to the new page. This is also the case even if it's only the extension of the page that you change. (e.g. "http://example.com/default.html" is changed to"http://example.com/default.aspx") You have to make sure that every page on the old website has a 301 redirect set up, which points to the same content on the new website. It's a bad idea to make a general redirect that redirects all the old pages to the home page of the new website, because this will annoy users and search engines alike. If it isn't possible to do a one-to-one match between old and new pages, you should at least have the old pages point to a new page with similar content. If this isn't possible to do automatically and you have too many pages to do it manually, try to do it for your most important and most visited pages. If the transition from the old website to the new website includes a change of domain name, you should consider breaking the process down into two separate steps. First move the old website to the new domain, setting up 301 redirects to one-to-one. After this is done (ensuring it has worked), then launch the new website on the new domain, again with correct redirects. This will minimize the risk of something going wrong in the process. Collect usage stats of referring links to your website (backlinks) and identify the most popular of these. This information can typically be found in an analytics or SEO tool, such as Siteimprove SEO. Ideally you would contact the owners of referring websites and have them change the link to point to your new page, but this isn't practically possible. You should however try to contact the owners of the most popular backlinks and have these changed, and make sure that the pages which the rest of the backlinks point to are properly 301 redirected. Make sure that all pages on the new website have page titles and meta descriptions. You can transfer these from the old website - if (and only if!) they are unique and descriptive of the page content. If you haven't focused on creating search engine friendly page titles and meta descriptions yet, now is a great time to get started. When you launch your new website it's a good idea to have 2 complete sitemaps configured: an HTML sitemap for users and search engines, and an XML sitemap for search engines only. An XML-sitemap can be submitted to the search engines through their webmaster tools (Google Webmaster Tools & Bing Webmaster Tools) which helps them crawl and index your website faster. Create a 404 Page Not Found page that's both user friendly and search engine friendly. Even though you've created 301 redirects for all content on your old website it is still important to monitor 404 errors. A good 404 page will help the users and search engines get back on track in an easy way. One way to do this could be to implement a search box on the 404 page, so users easily can search for what they actually looked for. It is also a good idea to keep the menu of the website on the 404 page for increased usability. Besides having a user friendly 404 page, it is also very important that the page actually returns a http code 404 so search engines are made aware that they followed a broken link. You should also ensure that you have tracking on your 404 page, so you can identify the referrers and fix the broken links. If you aren't careful you could end up having the 404 page being one of the most visited pages on your new website. Review and update your robots.txt file, if you have one on your old website. The robots.txt file is used to inform search engines about pages you don't want crawled and/or indexed. This should be updated to match your new URL structure. It's also important to make sure that any development or test websites aren't crawled as this can result in duplicate content issues. In this case, it's a good idea to use robots.txt to block the search engines, and at the same time add password protection as an extra level of security. Use a quality assurance tool such as Siteimprove Quality Assurance to ensure that there are no broken links on the website. Even though you've set up 301 redirects for all your old content, problems can still arise, especially if some of the old pages employ absolute URLs in the links instead of relative URLs (e.g. "http://example.com/users/foo.aspx" vs. "/users/foo.aspx"). Last but not least, Google recommends that if you have changed your domain name, you keep the old domain name with the 301 redirects for at least 180 days as a period of transition. If you follow these nine simple tips you minimize the risk of your website disappearing from the search engines in the transition. Just remember that it can be of great advantage to think about search engine optimization as part of the brainstorming and design phase when you are starting your new website project. If you are getting a new website regardless, why not make it search engine friendly from the beginning?